• ComicBook.com has the highlights of The New York Times discussion with Scott Gimple, Andrew Lincoln and Steven Yeun, with Yeun sharing, “There’s some stuff coming up that we had so much fun choreographing. We are just idiots, smiling idiots! We’re so happy to hack and slash!” Blastr, The Daily Beast and Fansided have tidbits from the talks. Ahead of the panel, BuzzFeed gets tips from the trio on surviving a zombie apocalypse. • Jimmy Kimmel Live!‘s Guillermo, complete with Daryl-esque crossbow, stars in a sketch spoofing The Walking Dead and highlighting limited-edition Slim Jim “Carnage Asada” Steakhouse Strips. • Today visits The Walking Dead set and meets with Andrew Lincoln, Norman Reedus, Steven Yeun and Greg Nicotero. • E! Online learns from Gale Anne Hurd that “there will be a lot of action, there will be a few tears, and we’ll be seeing an entirely new aspect of the world that we’ve seen thus far” when the midseason premieres on Feb. 8. • The Hollywood Reporter speaks with Scott Gimple, who teases storylines involving the Alexandria Safe-Zone and Negan. • Scott Gimple and several cast members — Andrew Lincoln, Lauren Cohan and Michael Cudlitz — did a Google+ Hangout, and ComicBook.com has a video of the entire session. • Lauren Cohan visits Jimmy Kimmel Live and talks about getting pulled over by a policeman after a long day of shooting The Walking Dead. 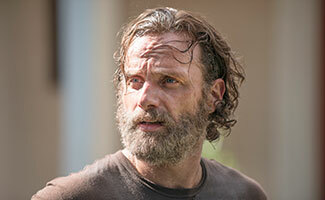 • The Oregonian updates viewers on where The Walking Dead left off back in December. • Josh McDermitt answers 20 questions from Uproxx. • NJ.com reports on Seth Gilliam’s visit to a New Jersey high school where he discussed his role on The Walking Dead and revealed that the “blood” on the show is a mixture of Hershey’s syrup and food coloring. • Moviepilot features 20 films where viewers can watch The Walking Dead actors, past and present. • WGN Radio includes Greg Nicotero (the “modern day hotshot of FX makeup”) on its list of the best FX make-up artists of all time. To stay up-to-date on all the latest news about The Walking Dead, sign up for the weekly Dead Alert newsletter.